The work of the French rationalist is best understood within the politics of the 17th century, as cogently presented here for the non-philosopher. Born in 1596, Descartes reached adulthood at the start of the Thirty Years’ War, the bloody European conflict rooted in religious clashes between Protestants and Catholics. Born Catholic and educated in the Jesuit tradition, Descartes spent some time seeking a suitable career—perhaps as lawyer, perhaps as engineer. As the latter, he traveled throughout Europe as a military consultant, although Grayling suggests provocatively that Descartes may have served as a spy. The discovery of clandestine activities, the author argues, may explain why Descartes absconded to the Netherlands (tolerant and out-of-the-way) in 1628 and began his purely intellectual investigations. Yet, in the charged atmosphere of the Counter-Reformation, to be a man of science was no small risk. A decade earlier, Galileo had been excommunicated for publishing evidence supporting the Copernican model of the solar system. Descartes, mindful of these difficulties and a devout Catholic, sought to separate matters of faith from matters of reason. For the scientific revolution to continue, he needed to wipe the slate clean and start over, and thus he conceived his Method of Doubt. Much of his life in the Netherlands was taken up with the careful and measured working out of his ideas on mathematics, logic, optics, physics, medicine and many other areas of rational inquiry. He also slept ten hours a day, lingering in bed until noon, and had an affinity for cross-eyed women. 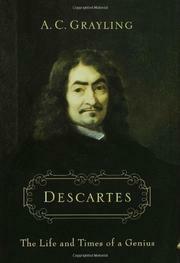 After the publication of his work, Descartes was arrogant to a fault in defending his ideas. Perhaps too vain in later years, his commission to personally tutor the Queen of Sweden led to his death from pneumonia one Scandinavian winter. “I think, therefore I am” is only the beginning of the story.